The newly started war in Croatia resulted in occupation of Dalmatia by Venetians, led by doge Pietro Orseolo, and the same policy was continued by his son Otto. The new ruler Krešimir III and his coruler Gojislav were at first in good relations with Pietro Orseolo and Basil II, who's authority they formally acknowledged. But following the strengthening of opposition in Venice, regarding the hereditary policy of the Orseolos, Krešimir decides to invade Dalmatia, a move which would later prove to be hasted. 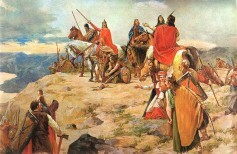 In the fights against Basil II, Croats were assisted by Hungarians, and good relations to the northern neighbors were also preserved by Krešimir's heir Stjepan I. During Stjepan's reign, the function of Croatian bishop in Knin was reestablished. 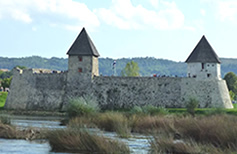 Medieval fortifications are probably one of the most recognizable symbols of this period. Apart from defensive, they also had a residential purpose, thus, they often contain shapes that combine those two functionalities. Unfortunately, those preserved until today represent only a small portion of their original number.